Back in early 2007 I was still running my company, State of Mind Seminars, Inc. At that time, I was writing more formal weekly newsletters and giving educational seminars, but most people remained blissfully unaware of the crisis that was about to unfold… That’s why I was hammering away on bubbles and the spectacular excesses of credit that I saw. 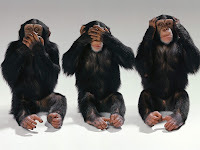 People generally didn’t want to hear it then, and I’m sure most still don’t want to hear it now – but at least they are paying a lot closer attention, that’s for sure! 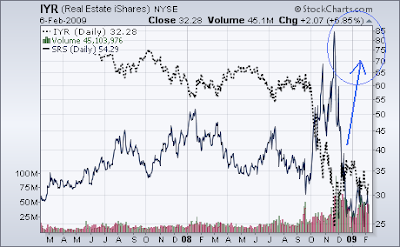 The bubble in residential real estate is what first got me interested in bubble dynamics. I owned many rental properties and began to notice how the rents that I was able to obtain were simply not enough to pay for the cost of owning homes – something had changed, obviously. I wasted no time and promptly began to sell all my real estate holdings, despite being quite good at the leverage it up game. Friends and family thought I had gone off the deep end! Not so much anymore. Now, almost everyone is all familiar with that, but most people remain unaware that Commercial Real Estate (CRE) was at least as out-of-whack. How did I know? Because CAP rates were at HISTORIC lows. All this means is that the ratio of rents received to the capital invested was less than at any other time in modern history. For a good review of bubble dynamics, I included my recap of Hyman Minsky’s Seven Bubble Stages near the beginning of my article Half Way to Zero. And then I showed this chart showing how support had been broken and that the peak in CRE was almost EXACTLY 18 MONTHS TO THE DAY! I’ve been harping on those bubbles, haven’t I? Exponential rises are always followed by collapses, and the losses happen faster than the gains – EVERY TIME! But that’s all history. By now people are beginning to realize that not only did we build too many houses, but we also built too many shopping malls, too many Starbucks, and just too many of almost everything. What about the future? Is the move in CRE over? Has all the misallocation in supply been reflected in price? Today we have a new tool to help us tell what’s happening in the Commercial Real Estate arena. A company called Markit provides credit spreads on CRE companies given their various commercial credit ratings. 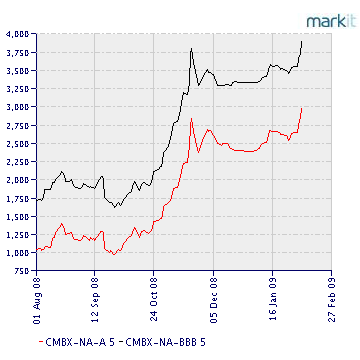 Their indexes track the spreads and present them in graphical form via their CMBX index charts. 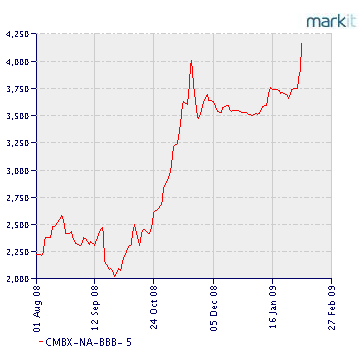 Here’s where you can find the Markit CMBX Index Charts. While the AAA chart may not be making new highs yet, most of the others are. How many CRE companies would fall under the AAA rating? Ah… not many. 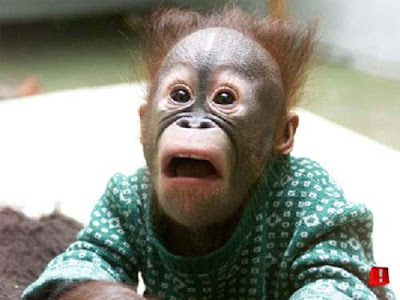 That monkey pretty much sums up how CRE owners are feeling right about now! So, I was looking at those CMBX charts and noticed that they look awfully familiar… They look just like the chart of IYR, which looks just like a chart of the SPX, which looks like all the other indices but turned upside down! 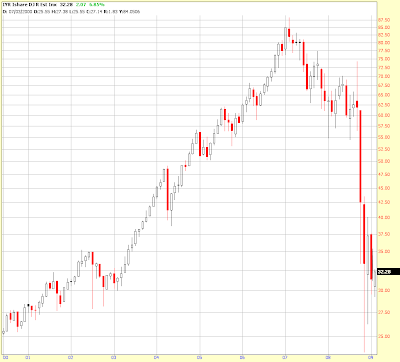 My, oh my – that’s the same chart pattern. Don’t tell your friends, but there’s a divergence here. Do you see it? 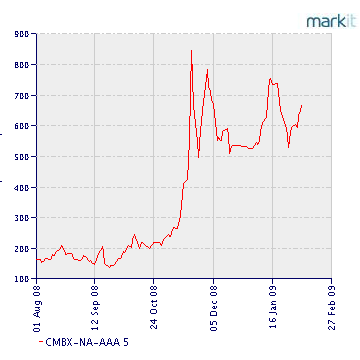 If the CMBX is making new highs, IYR should be making new lows, but it’s not. It’s looking more like the triple A charts than the triple B. Is all CRE triple A? No? I thought not. 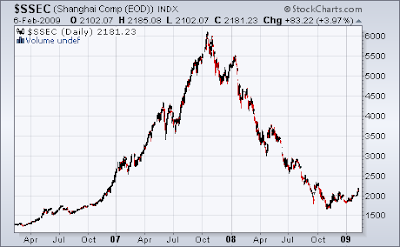 So, the question then becomes is that parabolic collapse over and was the November low THE low in IYR? 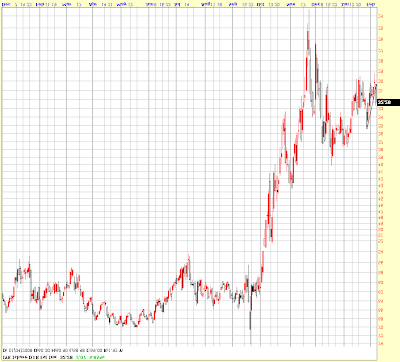 It could be, that 74% haircut was pretty dramatic and is in the range where parabolic declines can end. They can also end in 90% losses too. Well, if the CMBX is leading and you look at these breakouts, it leads to me to believe that that parabolic collapse may not yet be over. When making investment decisions, short or long, I like to look at the Point & Figure (P&F) charts to help me determine if I’m on the right track. 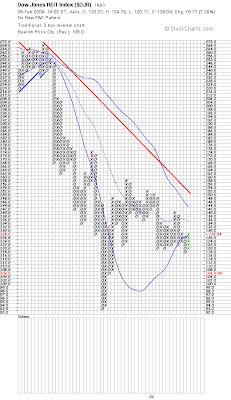 Here’s a P&F of the Dow Jones Real Estate Index that shows a target that is still beneath us. 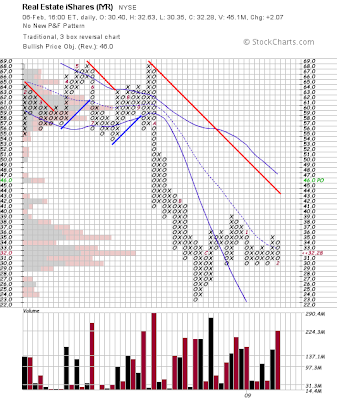 I note that the IYR P&F just flipped and is showing a breakout higher with a higher target. Here’s both, which is correct? That’s for you to decide, I’m just providing the evidence on this one! 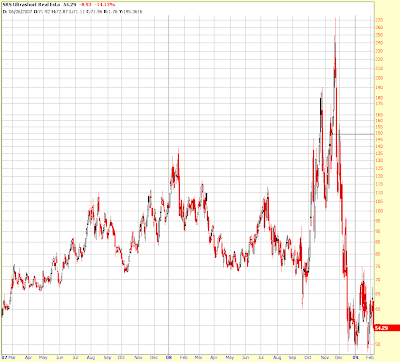 If we haven’t seen a bottom in IYR, we are obviously much closer to one that we were in 2007! Picking bottoms is a fool’s errand, however. While the prospect of quick gains from a big bounce sounds tempting, it is still completely possible to lose 50% of your investment or more on a continued collapse. Me? I believe it’s best to get involved long when the fundaments are in place to support sustainable growth. I don’t think we’re even close in that regard and with spreads still widening, any long bet here should be considered short term, least that divergence between spreads and price get you. Oh, and I know a lot of people reading this like to play short IYR by investing in SRS, the double inverse of IYR. As IYR goes down, SRS is supposed to go up. Without getting into a big discussion of why, SRS does not do the job over time – only on a daily basis. Thus SRS is NOT to be bought and held – here’s a two year chart of SRS, it should look more like the inverted chart of IYR above, instead it looks more like the upright chart! 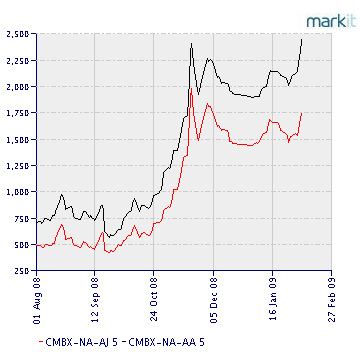 So, watch the CMBX index to help determine if the underlying stress has lifted on CRE. And, if you’re wondering how to tell when the time is right to invest in residential real estate for your situation and your area, it’s simple and it takes just a few minutes of research. Start by identifying what you believe to be a good rental property then add up all the costs of owning it WITH CONVENTIONAL 30 YEAR FINANCING. 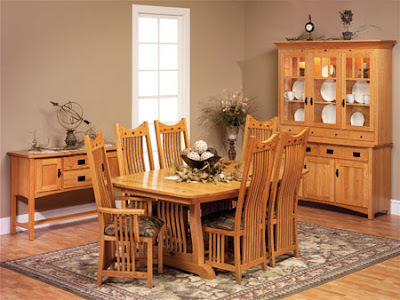 Include everything – principle, interest, taxes, insurance, and maintenance. Then look through the classifieds and talk to realtors about similar homes in the area and see what that type of property receives in rents. If the amount you can rent it for is less than the amount it costs you, then it’s no investment at all, it’s a beast of burden. Hey, isn't that a Stone's song too?